Early Spring is perhaps the most controversial of all of Chinese painter Guo Xi’s landscape paintings. It was completed in 1072 and to the casual observer would seem a simple, yet highly detained landscape painting of mountains, trees and a waterfall. But, if you consider that the painting was completed during the Song Dynasty when the country was ruled by Emperor Shenzong, a reformer who worked to improve the living conditions of peasants and the unemployed. 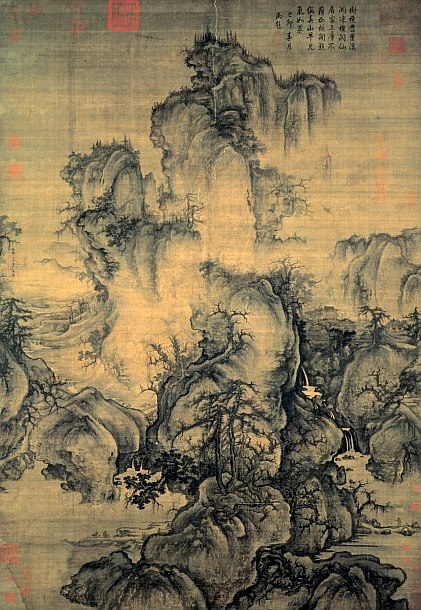 Guo Xi’s son, Guo Si, explained the painting and how it represents a harmonious society…The mountain peaks represent the emperor and his government, important members of Chinese society are represented by the lofty pines growing on the mountains, scholars travel to a temple near the top of the painting, peasants and fisherman can be seen along the coastline, and a spring rain under fluffy clouds benevolently blankets the landscape signifying a good and just government. To learn more about Guo Xi and see more of his famous paintings, please visit our Guo Xi biography. The most popular works amongst today's visitors.